All about wines and their makers. I was very fortunate to attend a sneak preview of the gourmet dinner that the Novotel Barossa Valley Resort is presenting, with help from the legendary Langmeil Winery, on Saturday the 20th of August at the NAB Barossa Gourmet Weekend. The preview dinner gave Michael Quist, the new Sous Chef at Harry’s Restaurant in the Novotel, and veteran Executive Chef James Dooley, the opportunity to present an outstanding degustation menu featuring local produce with each course matched to a wine from Langmeil. Brothers Paul and James Lindner, the head winemaker and the sales and marketing manager at Langmeil, joined in to tell us more about their wines and entertain us with stories about the joys of making and selling wine in Australia and abroad. They’ll both be speaking at the actual dinner too! 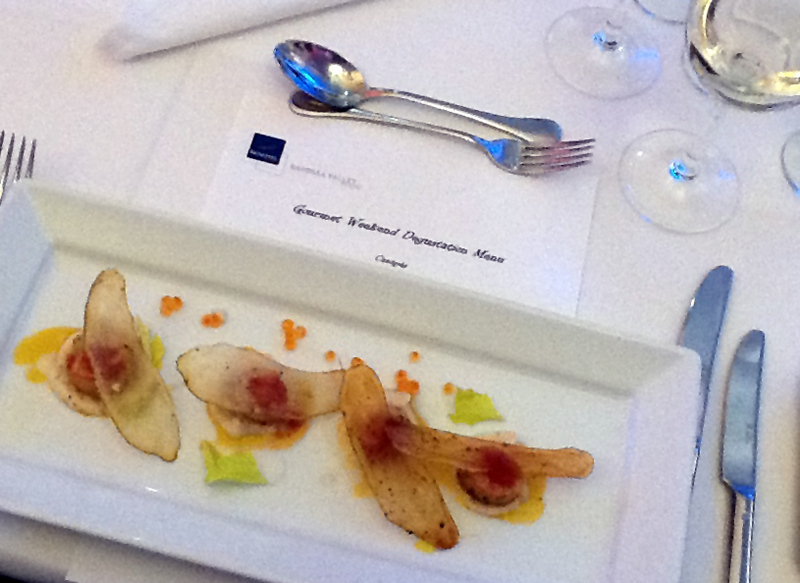 We started with some delicious canapes that were a great accompaniment to free-flowing Langmeil 2008 Sparkling Ondenc. For more info on this rare grape variety see its Wikipedia entry here. We’ll leave the details of the canapes out, as it will nice for you to be surprised when you attend the dinner, won’t it! The entree was pan-seared scallops on an exquisite truffled cauliflower cream with a spiced tomato vinaigrette (with salmon roe too, if my memory serves me correctly). This was well matched with the elegant Langmeil 2010 Eden Valley Chardonnay. Paul Lindner explained that most of the cold-fermented fruit was left unoaked, with about 30% finished in French oak with secondary malolactic fermentation to soften acidity. For main course we were treated to venison cooked two ways, both perfect with the rich and complex Langmeil 2008 Orphan Bank Shiraz. The delicious pithivier (that’s French for pie) of slow roasted venison was the highlight of the whole dinner for me, as was hearing from James about how the 140 year old Orphan Bank Shiraz vines were rescued from destruction by Langmeil and transplanted, preserving part of the Barossa’s heritage. For dessert a mandarin savarin with caramelised pineapple and pineapple curd was served, accompanied by Langmeil 2008 Late Harvest Riesling and this was followed by French cheesed and a 10-year-old Langmeil Tawny; a great way to finish! We would recommend this event to any food and wine lover! Of course, to make your Gourmet Weekend experience complete, you should book to stay at the Novotel Barossa Valley Resort! Every one of their 140 apartments has a has a kitchenette and private balcony with panoramic views across the Valley and they have 24 two bedroom apartments for families and friends to stay together. 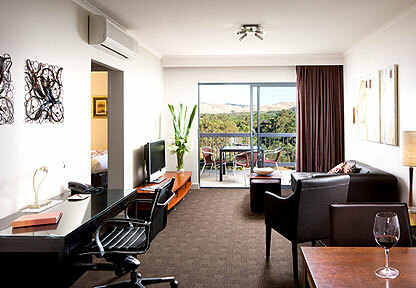 Facilities at the Resort include access to the adjacent Tanunda Pines Golf Course, an Endota day spa, and a dedicated wine tasting room showcasing a selection of the Barossa Valley’s finest. To book your seat at this special event, and arrange your accommodation, call Jon Cannon at the Novotel Barossa Valley Resort on 8524 0000. You can also become a fan of the NAB Barossa Gorumet Weekend on Facebook or follow the #BGW2011 hashtag and @BarossaDirt on Twitter for updates. This entry was posted in Barossa Valley, Events, Food, Wine. Bookmark the permalink.